Cars and dolls, diggers and prams, kids’ toy preferences do seem to fall out down gender lines. But where does it come from? And even when we think we are combatting gender divisions, are our own prejudices getting in the way? Just before my daughter turned one, someone asked what she’d like as a present. I didn’t have much hesitation in saying she’d like a baby doll. She made a beeline for them at all playgroups we attended, though we didn’t have any dolls at home. She got one, and she loved it. This seems completely impossible to me now (what one-year-old has any real wishes?). But before she even turned one, I thought I knew what she really wanted. I genuinely thought I had noticed a pattern, and that I was merely acting on her desires. And maybe I was. She still likes babies, and baby dolls. My son loves babies, both real and pretend, too. He once had a meltdown in the street when I forgot to lift him up to peep at the newborn of a friend. The thing is, I didn’t notice my son loving babies pre-one. I noticed him loving fire engines and diggers. Just as you’d expect him to. Professor Hines measured that this difference in toy preference is about the same amount of difference as there is between the average height in men and women. An obvious and recognisable, statistically significant difference. This chimes with what many of us have noticed amongst our children. The boys just love cars and trucks, diggers and trains, while the girls are drawn to dollies and prams, soft toys and cute animals. Maybe I was right. Maybe my children were wired differently - wired to prefer one type of toy over another. Except lots of us also know the kids who don’t. The girls who have no interest in dolls or small world play (I was one of them), the boys who have a bed full of cuddlies. The boys who happily push their toy pram around and the girls who can build a mean train track. In fact, Hines only finds a difference in preference after the age of one. Before that, all children prefer looking at the doll. For boys and girls under 12 months, the doll is the preferred toy. Why was I so keen to notice my daughter’s preference for dolls that I picked up on it before she was one, while it took till my son was nearly three for me to realise he liked them? I’d heard about the idea of confirmation bias in as far as it applied to political posts you read on social media - basically, you are more likely to believe articles or Facebook posts that chime with you already think. And you’re less likely to believe something that disagrees with your already-existing opinions. But it’s not just on Facebook that we are biased – we tend to notice and give more weight to experiences as well as information that confirms something we already believe. Did I notice a real difference between my children? Or was I just giving more weight to the things that confirmed my own biases about what girls and boys like playing with, or even about what girls and boys are good at? If toy preferences don’t emerge until after one year, and other differences reveal themselves even later, [Anne] Fausto-Sterling asks, then what else could be happening up until the age of one? One line of research that hasn’t been fully explored, for example, is counting exactly how many toys babies are given in the first year of life, and what kind of toys they are. She goes on to recount research into parents playing with their babies - finding that tiny baby boys, too small to even sit unaided, for example, might be shown over and over a particular toy (a football) and be given positive reinforcement for playing with it once they can reach out and grab it. They even show that mothers play more physically and talk less to their sons than their daughters. Obviously I’m horrified to find that these outmoded ideas about boys and girls might have been seeping out of me unconsciously. There is no doubt that as adults, we do apply gender to children’s play. The aisles of pink and blue in the shops signpost pretty clearly what many adults think boys or girls should be interested in. And while there’s a growing backlash against this, as parents we are still fighting against our own ingrained prejudices. How much have my own biases already played a part in shaping my children? Even when I think I’m offering equality, I might well unconsciously be pushing them in one direction or another, reinforcing one thing over another. I think my kids choose their toys, or books or games, but I’ve started to think about how they don’t make those choices in a vacuum. Let’s take one example. How many children’s TV shows or films show female characters fighting - in hand to hand combat or with weapons? There’s one of the Lego Ninjago Ninjas. Rey in in the newest Star Wars films. I’m sure there are more, but they aren’t all that easy to think of. If you see aggressive violence (for example, not fighting in self-defence) it overwhelmingly tends to be from the male characters. Even in Frozen, when they ride to Elsa’s ice palace to capture her, it’s all male soldiers as the attackers. When the Observer conducted a survey into the gender of ‘baddies’ in the 100 most popular children’s picture books, they found storybook villains were eight times more likely to be male than female. So should we be surprised that boys are observed to play more weapon or fighting games than girls? When they see it depicted over and over on screen and in books as a boys’ pursuit? How about the other side of that coin – the caregiving roles. How many people buy a baby doll for their first child when they are expecting their second? Chances are, if their first child is a girl they do, and if their first is a boy they don’t. Not everyone, of course, but as a generalisation, parents prepare a daughter for the advent of a new baby with something for them to care for ‘just like mummy’, in a way that they don’t with their sons. The Observer picture book survey showed mothers were present almost twice as often as fathers. In fact, fathers appeared alone (rather than alongside another parent) in just four books. So again, should we be surprised that boys who like playing with dolls and babies seem to be the exception rather than the rule? So is it biology or society driving these differences? Am I influencing them with my thoughts on gender roles or is it all there in their DNA? Does it even matter? It’s just play – what possible consequences are there for us consciously or unconsciously gendering our children’s play? Saini concludes that it’s just not possible to pin down these observed differences in toy preferences to nature or nurture. The truth is, no one yet knows whether there is any biological basis for the differences we notice in the way our children play, that splits down gender lines. (My instinct tells me there isn’t, but as we know, I’m probably biased.) And we also don’t know how much (or if at all) input from adults, siblings, books, TV, toys or society impacts on children at very early ages. What we can say is we couldn’t possibly unpick all the societal influences being soaked up by their developing brains from any underlying biology. Wherever it comes from, though, adults gendering toys does matter. When we make a division between which toys are for girls and which are for boys, what we are often doing is assigning a status to them. And if it’s a ‘girls toy’, chances are the status is low - we think a boy will be taking a step down to play with them. If a boy shows interest in a dolls’ house or a princess dress he is much more likely to be shamed, in a way that a girl playing with the construction toys or the knight outfit isn’t. Because being ‘girly’ is still forbidden for boys (and can also be less desirable for girls as they get older). What does this tell them? That ‘girly things’ aren’t as good, aren’t valued, aren’t aspirational. Until we start valuing all play we can’t fix the obvious inequalities we see in later life. If we subtly (or not so subtly) give the idea that we think that some forms of play are inferior, all kids take on the idea that some activities are inferior, necessary but inferior, and crucially, gendered – from looking after children, to cooking, or doing the hoovering. Play is a chance for children to try out roles, to mirror behaviours and to process learning. When we, or other adults, impose our own thoughts about who should do what, we narrow children’s possibilities – not just in the short term, but in the long term too. Changing this means supporting the girls who want to join in traditionally male-dominated activities, and making sure that the boys are also fully encouraged and supported to take part in traditionally female activities. We can’t have one with out the other. Boys (and girls) need to know that we value the skills of nurture, care and empathy, and that we support them to learn about the world through that lens, just as we support girls and boys to learn about it through the lens of physical activity, of trial and error and taking risks. When the boys (and girls) know that the adults around them value rather than denigrate ‘feminine’ qualities, regardless of whether there is any biological background noise in their brain, they will learn to excel at them. When we change our societal expectations, humans adapt and outcomes change. Only seventy years ago, the University of Cambridge didn’t award degrees to women. Now 35% more girls attend universities across the UK. We can all see that children are adaptable and malleable, that they have different skills and interests. What we probably can’t see is whether their different interests have anything to do with their gender. When we begin to expect exactly the same of our children regardless of their gender (and stop measuring their differences) inequalities must begin to reduce. Once we start to keep our ingrained, unconscious prejudices to ourselves, they’ll probably work this out and explain it all to us. If you’d like to help make these changes, consider supporting the brilliant Let Toys Be Toys campaign. 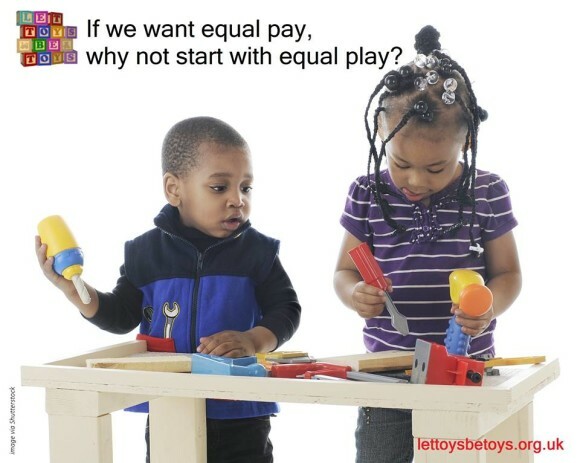 They’ve already lobbied successfully to remove gender labelling from many major toy retailers, and have lots of brilliant resources to help fight gender bias at home and at school.